Discover the best parts of Thailand on our 11 day Thailand Experience tour and make some great new friends along the way. You’ll be met and greeted at the airport by one of our group leaders who will travel along with you and the others in the group to ensure you have an amazing and hassle-free trip! We take care of all accommodation, activities and transport so you can just relax and enjoy the experience of a lifetime! Most people travel Thailand with us either solo, or with a buddy and are between 18 and 39 years old. The trip lasts 11 days & 10 nights with start dates throughout the year. Check out the Thai visa requirement here. You’ll be picked up from the airport & driven directly to our hotel near Khao San Road. Meet the rest of your group & your Ultimate Thailand tour guide later tonight for the welcome dinner. 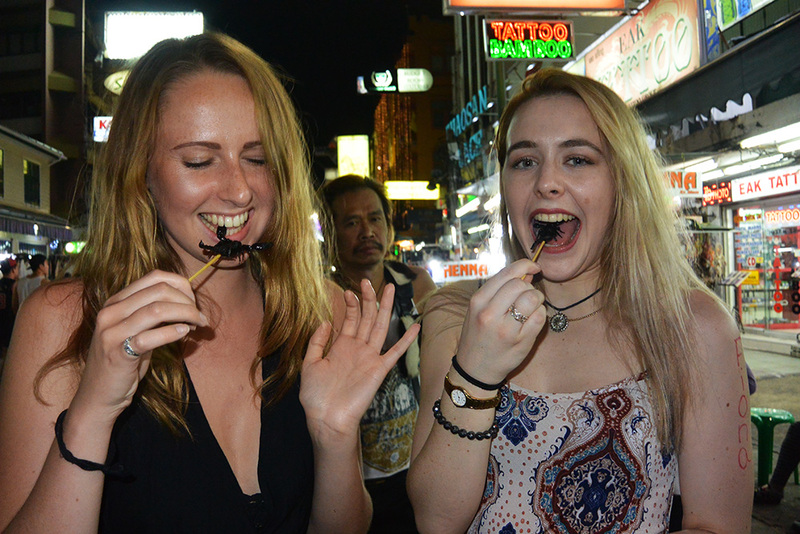 After your first taste of Thailand, we’ll explore some of our favourite Bangkok nightlife spots! The next day our city tour begins with a boat trip through Bangkok’s busy rivers and canals. Our local guide will show you a different side to the city and tell you all about Bangkok’s interesting history, religion and culture. Explore the Temple of Dawn ‘Wat Arun’, Reclining Buddha Temple ‘Wat Pho’ and check out the shopping mall and markets. You’ll get to sleep in the next morning, then head to the markets for some shopping before jumping on the overnight sleeper train. Grab some dinner on the train before settling in (to your own bed!) for the night. Today, we travel to paradise! 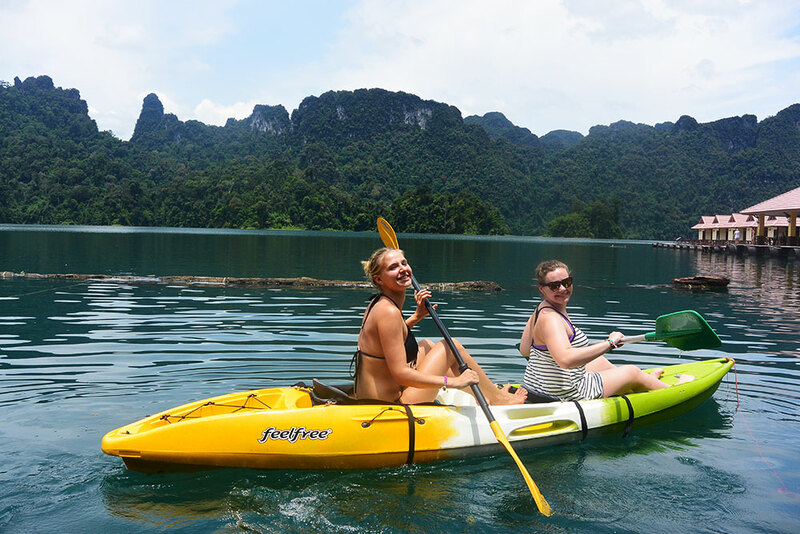 We’ll jump on the traditional long tail boat to our floating raft houses hidden deep in the rainforest of Khao Sok National Park. Spot amazing wildlife, breathtaking scenery & learn about the history of the area. The clear water is warm all year round so take a dip, kayak on the lake or just chill on deck! This evening, we’ll enjoy a tasty Thai dinner with fish caught for us fresh from the lake! Wake up in your bamboo raft house to the sound of monkeys in the treetops. After breakfast, we’ll head on a trek through the jungle and explore one of the many hidden caves before we travel to our next stop, Khao Sok Jungle Village where we get to visit some baby monkeys. On the way, we’ll stop off to spot baby monkeys in the jungle – they’re not shy! Chill out at Jungle Village, where you’ll have the option to go river tubing (depending on the season). That evening we go to our favourite Thai Reggae Bar for dinner. Today we make our way to Krabi, where we board the ferry to Koh Phi Phi for two nights of tropical island fun! We arrive late afternoon and check in to our accommodation. That night we meet at our favourite beach bar for dinner and enjoy sunset drinks and music on the beach. We’ll take you to our favourite bars on the island, to watch the famous beach fire shows & to explore the awesome nightlife of Koh Phi Phi! It’s time to explore the island! Start your morning with a swim at our accommodation before we head out on a boat tour of the Phi Phi Islands. 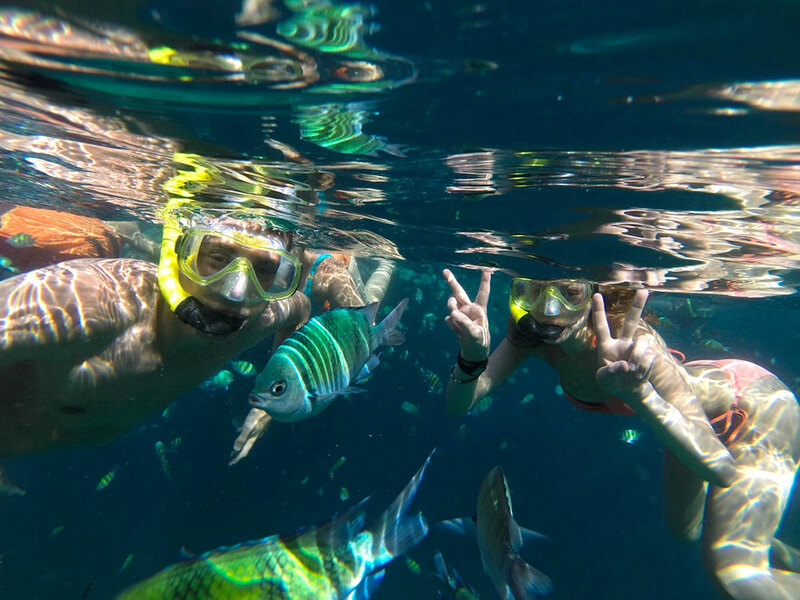 We’ll explore the area, take in our paradise surroundings and stop off for a spot of snorkelling where you’ll see loads of amazing fish on the limestone reefs. That night we party at one of our favourite beach clubs! 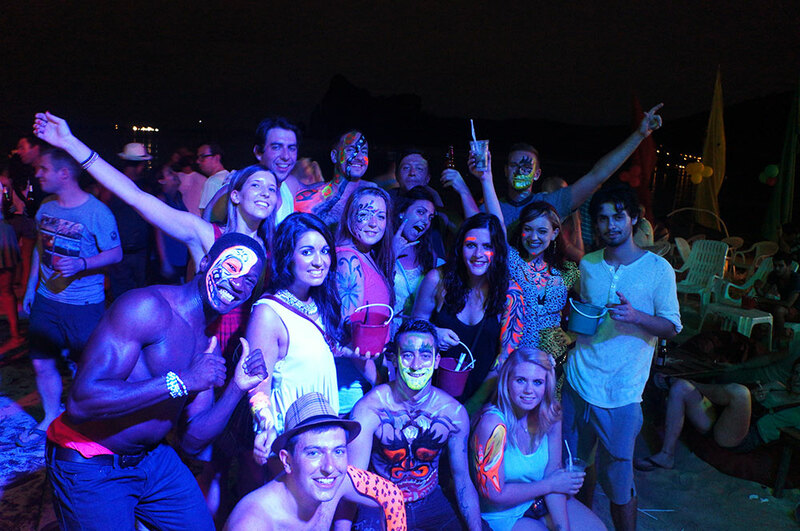 We leave Phi Phi and head over to Koh Phangan, home of the world-famous Full Moon Party. Arriving early evening, we’ll check into our accommodation located right next to the ocean, with crystal clear water and amazing sunsets. Tonight we relax with a few cocktails on the beach, watching the sun go down. Our second day here is a free day to relax on the beach or explore Koh Phangan. Soak up the sun at the beach, go for a swim, go kayaking, snorkelling or check out some of Koh Phangan’s awesome island activities. 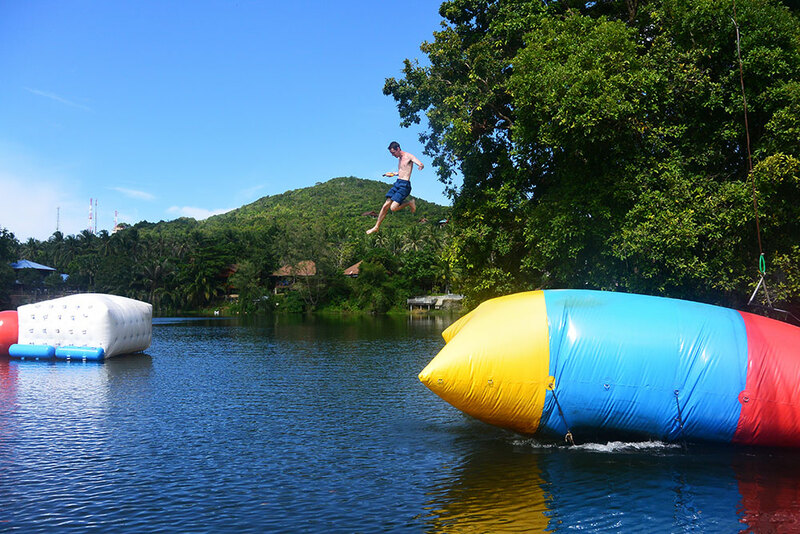 Get launched into the air at WipeOut or go for a stroll through the town – there is heaps to do on Koh Phangan! Your group leader will help to arrange everything. That evening we enjoy more drinks and a night of fun! Use the last day of the tour to plan the rest of your adventure in Thailand. Your group leader will help you arrange anything you need, whether you’re heading to another island or travelling back to the mainland. 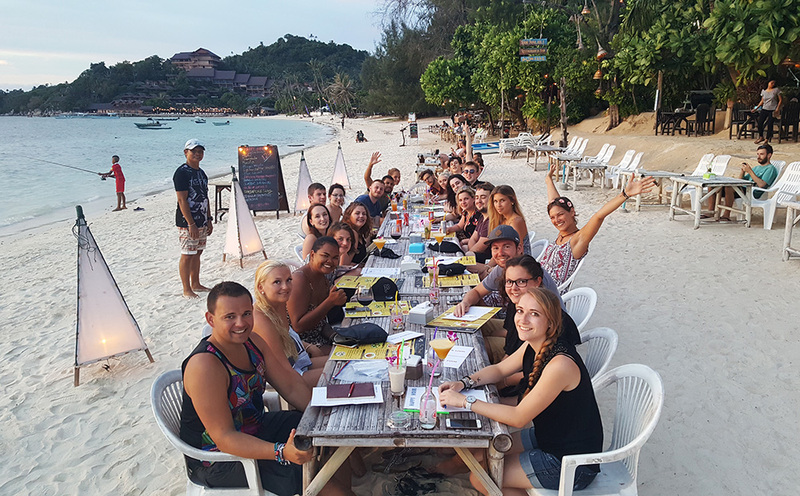 That evening we meet up for a farewell dinner & party on the beach at our favourite Koh Phangan beach bar! Your resort accommodation is included on the final night. Day 11: It’s your adventure! Today is the last day of your tour! 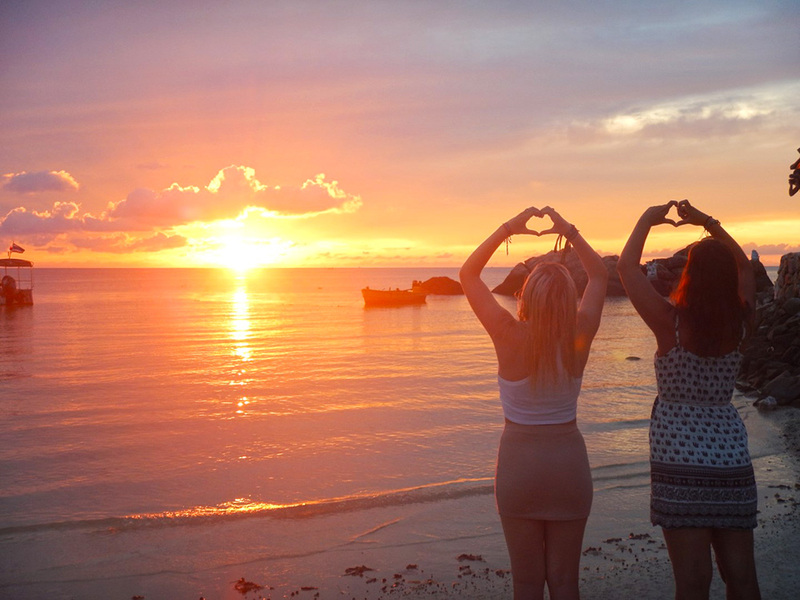 It’s time to check out and say your last goodbyes to your new found travel buddies. Need help with your onward travel plans, just ask your group leader, they will be more than happy to help! We’ll meet and greet you at Bangkok airport after your long flight and take you to your accommodation. Airport transfer can be arranged for anytime of day as long as full flight details have been provided at least one week before the tour starts (arrival date, time & flight number). • Farewell dinner and enjoy the amazing nightlife in Ko Phi Phi. 10 Nights shared accommodation included: hostels/floating bungalows/sleeper train (will be a mix of either twin, triple, or multi-share rooms). Or reserve it in advance by selecting our Private Room Upgrade package during booking. The upgrade applies to the stay in Bangkok, Koh Phangan and Phi Phi islands. Some meals included: 3 X Breakfast, 4 x Lunch & 3 x Dinner. 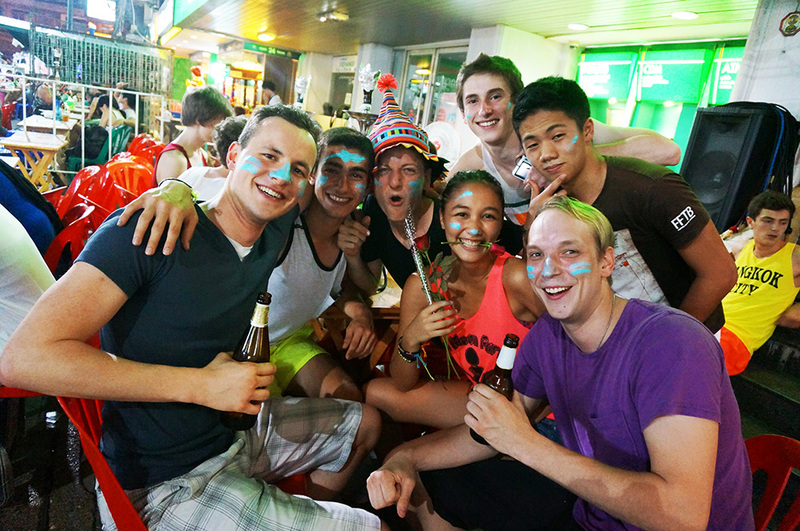 Group Leader: A Group Leader and local guides will be part of your Thailand Experience. Although it is possible your Grabatour Thailand tour may coincide with a Full Moon or Black Moon party, this is not scheduled as part of this tour and cannot be guaranteed. If you are interested in going to the Full Moon party, please make sure you do your research and plan your flights accordingly. You may need to extend your stay and do some independent travel after your trip ends. Your guide can help arrange extra accommodation locally. It’s best to arrive on the actual start date. There’s no activities on the first day, so you can arrive at any time. The	quickest option is to get a ferry to either Phuket or Krabi and fly to Bangkok from either of these airports The flight to Bangkok should be booked for no earlier than 3pm on day 11, if you’re flying internationally from Bangkok, your international flight should be booked for no earlier than 8pm on day 11. Your Group Leader will help with any other local transport and ensure you’re comfortable with all parts of your trip and onward travel. Your Group Leader can help you with these options in Thailand. Just let them know when you arrive. Or simply select our Return Transfer package during booking at an additional cost. Our Group Leader will help you out so that you can book the return transfer yourself. Or simply select our Return Transfer package during booking at an additional US $60. From Ton Sai Pier Koh Phi Phi to Bangkok by ferry+bus+flight joint ticket. Arriving earlier than the start of your tour? No worries! We can arrange an extra night for you, so you won’t have to move around. Price is based on twin/ double share, so you can split the cost between two if you’re travelling with a mate! Staying longer after the tour? Pre-arrange an extra night. Price is per person / per night in a dorm room (outside of Full Moon Dates). Staying longer during the Full Moon period? Accommodation will book out, so we recommend to pre-book. Price is per person/ per night in a dorm room and applies 1 day prior, on and 1 day after the Full Moon Party. Travelling to Koh Samui after or catching an onward flight? Pre-book your ticket (Koh Phangan Pier to Koh Samui Airport) now and collect at the end of Thailand Experience. Travelling to Koh Tao after your trip? Pre-book your ticket now and collect at the end of your Thailand Experience. Heading back to Bangkok? Catch the ferry / bus to Surat Thani Airport for cheap domestic flights. Pre-book your ticket now and collect at the end of Thailand Experience (flight from Surat Thani not included). Travelling to Bangkok after your trip? Pre-book your ticket (Koh Phangan to Bangkok via ferry and bus. Please be aware this is a loooong day travelling.) now and collect at the end of Thailand Experience. Our awesome elephant experience includes 3 nights accommodation, a full day spent at a elephant jungle sanctuary, where you will meet and interact with each of the friendly elephants personally and heaps more exciting activities! Learn about elephant behaviour, and discover the unique and interesting history of each elephant as you touch, play, feed, and photograph them. You will also be able to have the opportunity to bathe and brush the elephants while they enjoy wading through the water. Next, it will be time for a therapeutic mud spa. Feel free to get muddy as you cover the elephants in a protective layer of mud! The next day you’ll enjoy a jungle trek to a nearby waterfall, learning about the plant life around you and take a refreshing swim before heading back to Chiang Mai to continue your adventure! This was my first holiday were I decided to travel as part of a tour group, purely for the fact that I have not heard great things in the past about many tours but decided to give this one a try. I am really really glad that I did. Thailand Experience 11 day was life changing, and this was definitely partly due to our exceptional group leader Jake! Our group was small and our leader Olivia was able to give a very personal tour. She was very informative and fun to be around with, she made sure we tried unique foods that were specific to the region, and gave great suggestions in what to do when we had options to explore on our own. Thailand was beautiful! The food, sights, temples and way of life was awesome and humble. The trip was fabulous. Really enjoyed not having to stress about anything the way you would if you were travelling solo! I enjoyed the mix of urban-rural settings, modes of transportation, and the mix of traditional sight seeing and outdoor recreation. The last few days in Phi Phi islands were very relaxing and restful after such a busy tour. 11 Day Thailand Experience	Overall rating:	5	out of 5 based on 1182	reviews.